The Palestinian Prisoners’ Society (PPS) has reported that Israeli soldiers abducted, on Thursday at dawn, seven Palestinians in several parts of the occupied West Bank. 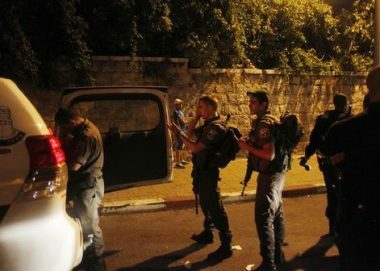 The Bethlehem office PPS said the soldiers abducted three Palestinians, identified as Ziad Naim al-Masri, Zeid Ahmad Sheikh and Bassel Mizhir, in Deheishe refugee camp and Marah Rabah village, and shot a young man. During the invasion into Marah Rabah, the soldiers searched the home of Ahmad Sheikh Qassem, who is held by Israel, and summoned his wife for interrogation. In Jenin, in northern West Bank, the soldiers abducted Hisham Sa’id Thiab, from his home. In addition, the soldiers invaded and searched homes in Qalqilia, in northern West Bank, and abducted Mohammad Muwafi, 22. In Hebron, in the southern part of the West Bank, the soldiers abducted one Palestinian, identified as Bassam at-Teety. The soldiers also invaded homes in Qalandia refugee camp, north of occupied East Jerusalem, and abducted a child, identified as Ismael Anwar Abu Zeidiyya, 14. It is worth mentioning that protests took place in the al-Am’ari refugee camp, in Ramallah, and Aqabat Jaber refugee camp in Jericho and Fahma village, near Jenin.